Born and raised in California, I have called Texas home for over 25 years now. I am married to my best friend and ever patient husband. He understands that my love language is coffee, and makes it for me every morning! 🙂 We have a son and a daughter, two crazy dogs, and we love to travel. I am a bit of a technology nerd. I love to read about leadership, self-improvement, and a good mystery novel. I am muddling my way through this blogging thing – writing about what inspires me to learn and grow and be a better person, and I hope I can inspire others as well. Adventure awaits. Welcome to my journey. First things first; your daughter is gorgeous! Second; reading the “more about me” makes me wish we lived next door to each other. I think we’d get along fantastically. I can’t wait to read more of your blog. 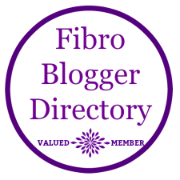 Along with a spinal cord injury (and complications caused by that) I also have Fibromyalgia and I love reading about how others handle it. Aww. Thank you! You are so kind. I will pop on over to your blog and check it out. Yes I feel like we learn more from each other than from the doctors sometimes.